If your child has been diagnosed with a hearing loss, you can contact The Shepherd Centre and our team of qualified audiologists, listening and spoken language therapists and child family counsellors can support you and your family. To delay treatment of hearing loss is to delay and impair the development of a child’s listening, language and social skills – impaired development occurs with all degrees of hearing loss, regardless of whether the loss is in one ear or both ears. If you suspect your child may have a hearing loss, visit your local GP. 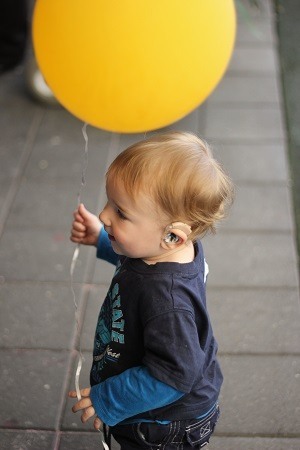 If your child is diagnosed with hearing loss, The Shepherd Centre can help. Please call us today on 1800 020 030 to find out more, or to make an appointment at one of our five centres through NSW and the ACT. Mild: 21–45 dB It might be difficult to hear speech and conversations that are soft, but you are able to hear voices clearly in quiet situations. A hearing device will assist most problems with mild hearing loss. Moderate: 46–65 dB Conversational speech is hard to hear, particularly when it takes place in background noise, and especially when background noise is high, for example when the television or radio are turned up. If background noise is low and speech discrimination is good, a hearing device will assist most difficulties with moderate hearing loss. Severe: 66–90 dB Normal conversational speech is inaudible, but can be detected with a hearing device. The clarity of speech heard is likely to be significantly altered and visual cues will help in understanding speech and conversations. Profound: 91 dB + The benefit derived from a hearing device varies greatly. Some may be able to understand speech if they are face to face with whom they are talking to, conversing in good auditory conditions, and wearing a hearing device. But others will find it impossible. For more information about the different degrees of hearing loss, please visit Australian Hearing.